Highly efficient, environmentally friendly, and competitively priced, the KOZI Model Baywin Pellet Burner is the most popular alternative heating source on the market today. Loaded with state-of-the-art features, this pellet burner will provide many years of trouble free heating comfort. The attractive design guarantees it will fit into any decor. Each appliance is equipped with many safety features such as; Circulation Fan Override Switch, High Temperature Sensors, and an Exhaust Sensor. Our MX 2 Control Light Module Monitoring System, standard on all pellet stoves, acts as a trouble shooting guide. At a glance, this diagnostic system will relay the operating status of your unit to ensure your safety and peace of mind. 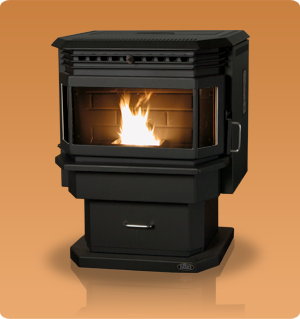 The KOZI Baywin Pellet Burner is available as a freestanding stove or a fireplace insert. The Electric Start Kit is standard on all KOZI model Baywin Pellet Stoves.